Strawberries are amongst the list of fruits that are liked and enjoyed by both children and adults due to their appealing and enjoyable taste. Apart from its delicious taste strawberries hold great nutritional value for human beings. Only those people in this world are successful who have a healthy mind and a healthy body. Doctors all over the world strongly recommend adding fruits and vegetables to regular diet to maintain a healthy body. Following are a few reasons that explain why strawberries are good and healthy for you. Juicy strawberries are not only good in taste but are rich in different kinds of minerals and vitamins that are good for health. Studies have found that strawberries are a great source of vitamin K, vitamin B6, vitamin B5, vitamin B2, and vitamin C and in addition contain several minerals that are useful and have a good effect on the immune system. Strawberries not only satisfy taste buds but apart from being rich in minerals and vitamins they also contain potassium, folate, manganese, dietary fiber and iodine. Other then vitamins and minerals strawberries also contain antioxidants that fight free radicals and remove the harmful toxins from blood thus preventing the cancer cells to develop in the blood. If you want to look youthful it is advised to make strawberries a regular part of your daily diet plan because of the anti-aging properties of strawberries. Strawberries slow down the aging process and also improve the brain health. Due to the fact that strawberries are loaded with nutrients, they are useful in not only prevention but treatment of several harmful diseases. For instance the blood sugar level can be maintained by consumption of strawberries as they have low glycemic level. High blood pressure, flu and constipation can also be treated by eating strawberries on regular basis as it is mineral and vitamin rich. People who are suffering from gout, catarrh and rheumatism are also strongly advised to make strawberries a regular part of their diet. Strawberries also benefit people by removing tartar and improving gum health. Keeping in mind all the above mentioned benefits of eating strawberries one must consume strawberries regularly and at the same time encourage children to do the same. 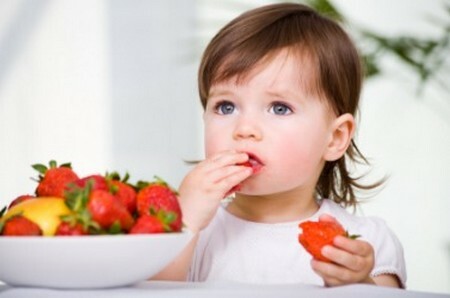 If children are reluctant to eat strawberries, they can be fed by mixing strawberries with other fruits like mangoes, banana, apples etc thus increasing the nutrient intake. Strawberries are not only eaten as it is but are an important ingredient of many delicious dishes and drinks such as desserts, salads, smoothies, fresh juices, shakes, cakes, candies, appetizers and ice creams etc. to enjoy good taste and nutrition you must buy bright red and fresh strawberries. Strawberries must be stored in a cool and dry place and it is advised not to store them for more than two days because when stored for a long time the nutritional value of strawberries decreases and they become less useful.